Performance NAPA of Fort Pierce is located between Oleander Ave & Sunrise Blvd on Bell Ave, we have been at this location for eight years now. We carry a large inventory of brakes, chassis, batteries, and filters, and can take care of most of your needs from automotive, marine and heavy equipment. We make hydraulic hoses and some battery cables. Staff attends annual training so that we have as much information as possible to better serve our customers; we also have ASE Certified Staff. Our professional, courteous, and knowledgeable staff are ready to serve you. 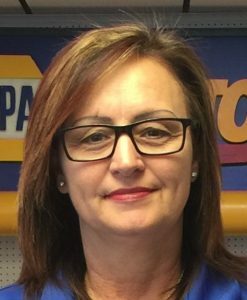 Store Manager Karen Smith started with NAPA in 1992. After years of traveling antique car auctions, she still gets to see a few people she knew from the auctions. Karen spends her free time with her family; nieces and nephews, her very spoiled dogs, and going to car shows.